A communication consultant shares proven tips for ensuring ERP project success. change management was the hands-down No. 1 ERP implementation issue experienced by organizations. Furthermore, and consistent with past reports, 66% of respondents said they failed to achieve more than half the expected benefits. Only 9% reported receiving more than 80% of the expected benefits. Why do ERP implementers accept such poor return on investment (ROI) metrics year after year? Given the millions of dollars organizations invest in new technology platforms and the integrations needed to optimize the business, shouldn't they invest a fraction of that amount in the very people who can make or break a business transformation: their employees? Based on the work of my company, frank, which specializes in technology change management and communications in guiding Fortune 500 organizations such as Cargill, Cox, GE, ING and PepsiCo through enterprise-wide IT implementations, we answer with a resounding yes to both questions. In fact, a Towers Watson 2013/2014 Change and Communication ROI Report quantifies the business value of effective technology change management and communication practices. Organizations excelling at these practices are "3.5 times more likely to significantly outperform their industry peers through a deep understanding of culture and behavior." Drop this finding into the high-stakes, high-pressure context of transforming a business with enterprise-wide technology and the value is even higher. Now that's a burning platform for change -- at an organizational, functional and extremely personal level. It's that sense of urgency that led to the creation of our tech-agnostic, frank5 Change-Communications Process and best-practices communication toolkits (see Figure 1). They serve as a strategic roadmap and set of tactical deliverables to optimize technology implementations by accelerating employee engagement and user adoption through go-live and beyond. Battle-scarred IT leaders, who have been through dozens of enterprise-wide IT implementations, tell us our approach is unique. Here are five critical lessons learned from years of driving technology adoption through creative, frank change communications. They can help improve your chances of success in implementing any enterprise-wise system, such as ERP, CRM, product lifecycle management (PLM) and enterprise asset management (EAM). 1. Engage employees early, often and frequently. In the implementation models traditionally promoted by ERP vendors, from the outset, vendor selection and system integration are intensely focused on technology. Early project planning is dedicated to obsessing over key milestones, tollgates and go-live dates. Project kickoff is often an event that only the ERP project team is excited about or even aware of. Other stakeholders? They're often left behind until it's too late -- when individual and cultural dysfunction, resistance, misalignment, workarounds and outright sabotage reign. Don't axe the change management or change communications line items. They will be your most valuable go-to strategies as the project rolls forward. 2. Drive action that maps to the technology-implementation process. 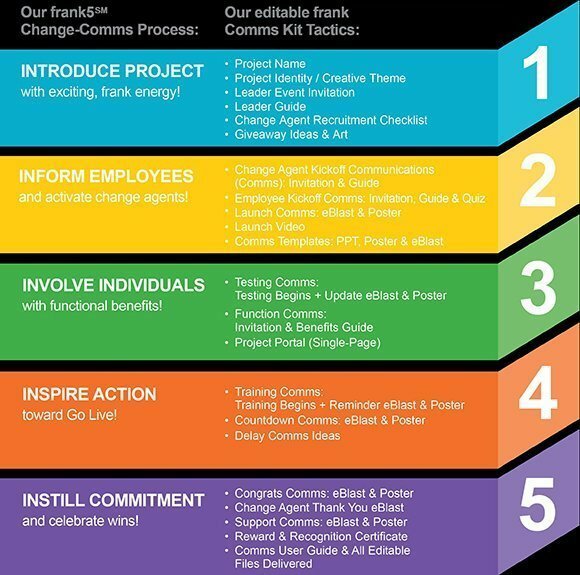 Ensure that all employee communications are harmonized with the key phases of the implementation process. If your organization is like so many others these days, it may feel like "initiative central" with several competing priorities. Tie your tech story to other corporate initiatives to deliver a more unified message to employees. This will help them connect the dots and prioritize their action items with their managers. 3. Drive action that maps to the Personal Transition Curve. 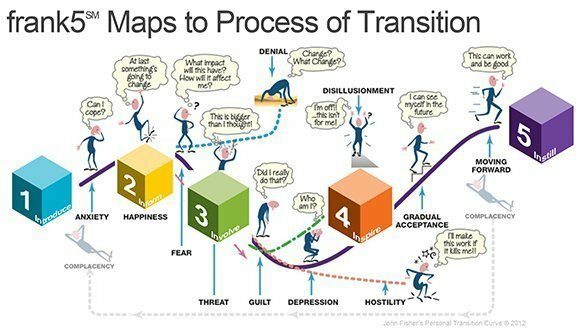 When it comes to the idiosyncrasies of human change -- just what IT professionals love dealing with -- we frank consultants appreciate John Fisher's Personal Transition Curve for its universality and levity, not to mention some of the genuine pain points it depicts (see Figure 2). Understanding and honoring the natural ups and downs of the human change process allows you to develop proactive change management and communications to empathize with and activate new solutions along the way. This ensures a smoother, more positively engaged ride for everyone through go-live and beyond. 4. Involve everyone -- from the boardroom to the boiler room. Our external marketing and branding expertise helps us target highly segmented employee audiences with the right messages at the right time. While your ultimate goal is to transform the entire organization, you want to use a cascading, change-communications approach of delivering key messages, tactics and action requests. Taking the pulse of the organizational culture early in the change process is critical to getting the segmented approach right. Insights gleaned about different employee audiences will help fine-tune how and when you touch, move and inspire executives, managers, functional leads and change agents during the change journey. Just like with the proven, measured approach of your tech implementation process, adopt the same discipline with change management and communications. Lastly, don't only take it from the top. Frank's Investigation & Insight phase, for example, is designed to check in with all levels of the organization at the outset. When we report back to executives with different perspectives from the field -- positive or negative -- real leaders will embrace and act upon that feedback. 5. Provoke frank conversations across the full lifecycle of technology implementations and process redesign. Successful, holistic business transformation doesn't happen with key stakeholders sitting on the sidelines, passively or aggressively. You want to identify and deal with resistance early in the process. Take on comments such as "here we go again…" or "I'd rather take a pay cut than talk to more people when I come to work." Be sure to monitor sentiment throughout the implementation journey. Hidden influencers or saboteurs can lurk in the shadows and cause suboptimal results over time. Building permissions and creating authentic two-way communication channels is essential to fostering one version of the truth. As technology professionals, when individual resistances rise and cultural challenges stall progress, it's easy to ignore the human side of IT implementations and stick your head in the technology sand. But don't. Says Shumon Zaman, a frank client and CIO and ERP project manager at energy services provider Lamprell PLC with more than 40 implementations under his belt: "You need to communicate constantly with people. Resistance comes because people don't know what to expect, and they hear rumors. My strategy from day one is sponsorship and communication." Our experience has taught us that software doesn't deliver business benefits, people do. Learn to creatively, courageously and confidently master the human side of IT implementations: That's where the big business payoff is -- at go-live and beyond. John Nielson is business development director and managing partner of frank LLC, a Minneapolis-based consultancy specializing in technology change management and communications. Since founding the company in 2005, Nielson has helped companies such as Cargill, General Electric and PepsiCo with their enterprise technology projects. Email him at john@areyoufrank.com or find him on Twitter@john4frank or Linkedin at www.linkedin.com/in/johnnielson.